(Seychelles News Agency) - For hundreds of years, the historic city of Bath in the United Kingdom has stunned visitors with its impressive Georgian architecture, carefully preserved Roman ruins and beautifully green countryside scenery. But now, Bath has become even greener by powering its airport shuttle bus with human waste. 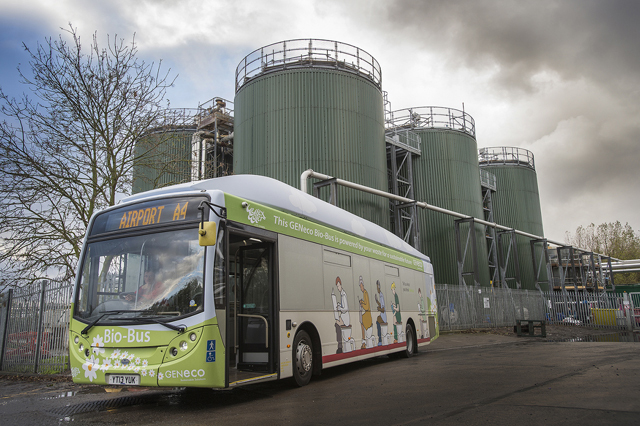 The 40-seat ‘Bio-Bus’ runs on biomethane gas, generated by the treatment of sewage and food waste, and will transfer passengers between Bristol Airport and Bath. It can travel up to 300 kilometres on only one tank of gas, which is produced using the annual waste of about five people. The waste is treated and turned into gas at the Bristol sewage treatment works, which is run by GENeco, a subsidiary of Wessex Water. Producing fewer emissions than traditional diesel engines the Bio-Bus is both renewable and sustainable and it also reduces the county’s reliance on fossil fuels. According to a press statement issued by Wessex Water, GENeco general manager Mohammed Saddiq said the plant was producing enough biomethane gas to the national gas network to power almost 8,500 homes on top of fuelling the Bio-Bus. 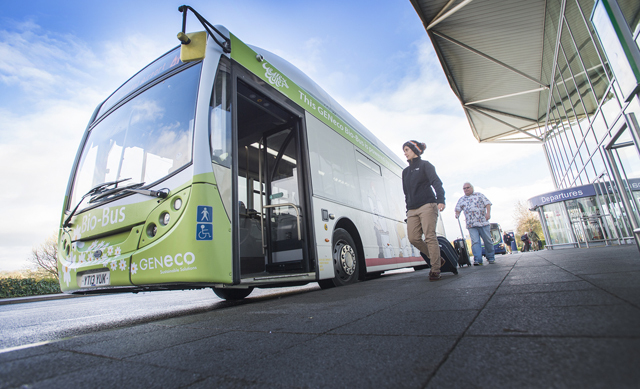 “Gas-powered vehicles have an important role to play in improving air quality in UK cities, but the Bio-Bus goes further than that and is actually powered by people living in the local area, including quite possibly those on the bus itself,” he said. Media and PR Officer at Wesex Water George Keast said the utility company researched and built a multi-million pound ‘gas-to-grid’ plant at the GENeco sewage treatment works to provide fuel for the Bio-Bus. The GENeco sewage treatment plant treats around 75 million cubic metres of sewage waste and 35,000 tonnes of food waste, collected from households, supermarkets and food manufacturers annually. In return, 17 million cubic metres of biomethane is produced every year at the Bristol plant, where a process known as anaerobic digestion – where oxygen-starved bacteria breaks down biodegradable material – produces the methane-rich biogas. In order to use the gas to power a vehicle, the biogas must be upgraded by removing carbon dioxide and adding propane. Compared to normal diesel vehicles, the Bio Bus emits up to 30 percent less carbon dioxide. Wessex Water believes there is “huge potential” in using biomethane to power homes and vehicles. 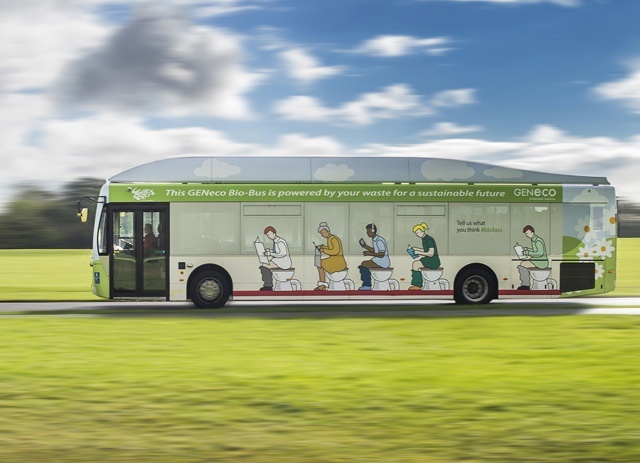 The squeamish need not fear any bad odours or funny-coloured gases escaping from the bus, as Keast says the biomethane is both colourless and odourless, meaning the exhaust of the Bio-Bus will emit less odours than even a normal diesel bus. Aside from the obvious slew of toilet humour, Keast says the general feedback has been good, even if a tad jovial. For the moment, Keast says the Bio-Bus is the only bus in the UK to run on biomethane generated from food waste and sewage. “While we currently have no plans to make another bus, we have had some of our food waste customers talk to us about potentially running their tankers on biomethane,” he said.